Summary: “Dante can swim. Ari can’t. Dante is articulate and self-assured. Ari has a hard time with words and suffers from self-doubt. Dante gets lost in poetry and art. Ari gets lost in thoughts of his older brother who is in prison. Dante is fair skinned. Ari’s features are much darker. It seems that a boy like Dante, with his open and unique perspective on life, would be the last person to break down the walls that Ari has built around himself. But against all odds, when Ari and Dante meet, they develop a special bond that will teach them the most important truths of their lives, and help define the people they want to be. But there are big hurdles in their way, and only by believing in each other―and the power of their friendship―can Ari and Dante emerge stronger on the other side” (Goodreads). This book is quiet. 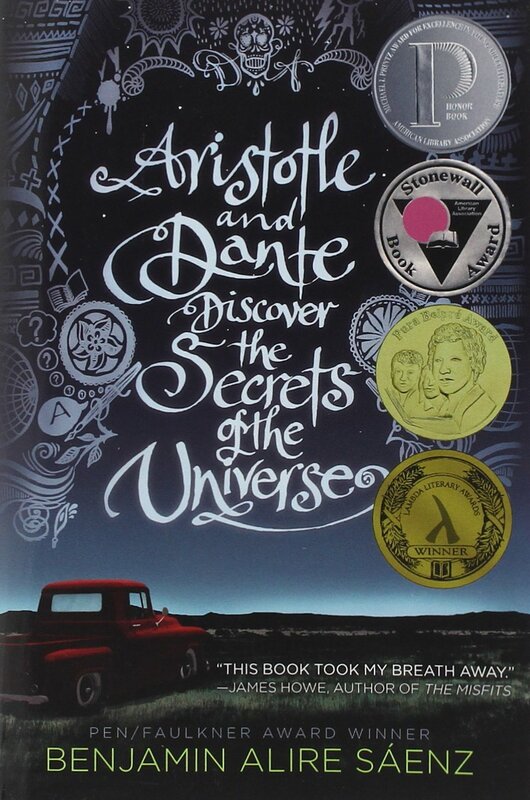 For having such a long title, Aristotle and Dante Discover the Secrets of the Universe says so much in few words, says so much in gestures and moments and long silences. It speaks without needing to say anything. And I think that is remarkable. I read this book in maybe two hours on the PSAT morning (as a senior, school started at 11 for me). Once I started, I couldn’t stop. It captivated me in everything that it is. As the title suggests, it’s a story about discovery, both of the self and the outer world. It is a story about summers, spent talking and not talking. It is a story about love, but to have that love, both boys have to discover themselves first; they have to discover the secrets of their own worlds before they discover the entire universe’s secrets. For Ari, this means learning about his brother, for Dante, this means exploring what it means to be himself. I will admit that I cried (which, given how often I mention this, makes me sound as though I cry a lot reading, but I swear I don’t), excessively. This book just…means a lot to me. It’s hard to truly express how much a book means to me without 1. giving away the ending and 2. becoming a blubbering mess. I suppose you’ll just have to take my word for it. On the level of technicalities, this book plays off of subtleties. It covers a long period of time, there isn’t a lot of actual plot, and some of the scenes felt unnecessary (I got the point of the arm breaking scene, but it felt weirdly placed). However, these are all technicalities, as I said, and at the end of the day, this book’s reliance on subtleties and between-the-lines writing saves it. Everything felt under the surface and I love that so much in a piece of literature. I don’t enjoy reading things and having all the answers. Aristotle and Dante lives up to its name. I think somewhere in this book I too discovered some of the secrets of the universe.